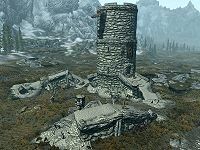 Western Watchtower is a dilapidated stone fort just west of Whiterun. It is situated along the main road heading west from Whiterun, allowing the Whiterun city guard to watch for any potential threats approaching from that direction. The tower can be entered via the crumbling wall that forms a ramp upwards. The area between the fallen walls contains two burnt corpses with loot, a training dummy and the charred remains of a wooden hut. Inside the tower are two unowned bedrolls and a small table with a lantern. The second floor contains an archery target and a bale of hay, while the top floor is empty. There is an Imperial Legion banner flying from the tower. Once the Dragon Rising quest is complete, four Whiterun guards will be stationed at the tower to keep watch for enemies (see bugs). There are two iron ore veins in the rocks to the west. The Western Watchtower will not be marked as a location on your map until the quest Dragon Rising begins. The Imperial Legion banner will be replaced by the banner of Windhelm if the Stormcloaks capture Whiterun during the civil war questline. Sometimes the guards may be missing, possibly if the Stormcloaks hold Whiterun. This page was last modified on 7 January 2019, at 05:33.